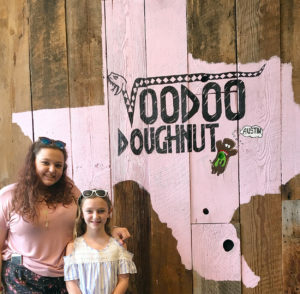 Earlier this month, we spent a week in Texas exploring various cities and the sights! 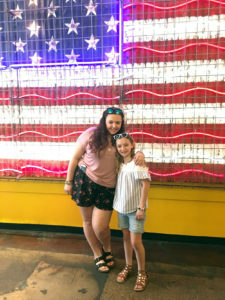 It was our spring break trip with the girls…our college daughter was even able to join us for a few days over the Easter holiday. Having all five of us together made for one happy mom! 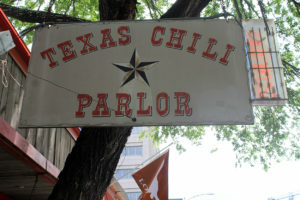 Today is all about donuts, chili, and BBQ in Austin! 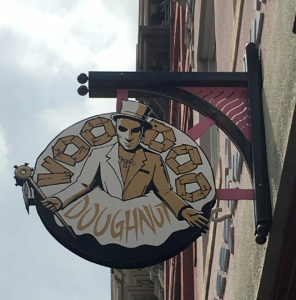 Voodoo Doughnut…They started their donut story in Portland, Oregon, but now have five locations, including one in Austin. 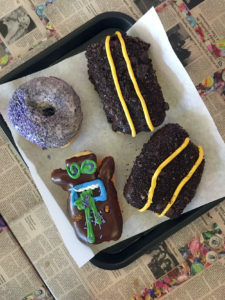 There are over 90 different donuts on the menu, with fun names like the Grape Ape, Captain my Captain, Maple Bacon Bar, the Loop, the Pot Hole…and of course, the VooDoo Doll doughnut. And as whimsically decorated as they are, they taste just as fresh and good! 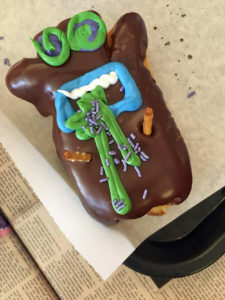 I, of course, just had to try the VooDoo Doll, which has a raspberry filling. 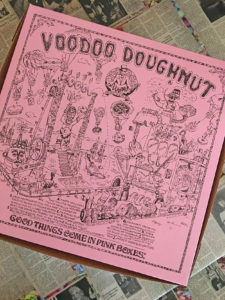 There is plenty of seating in the eclectically-decorated Voodoo Doughnuts, and SO much to take in while you’re indulging in your donut…tables that are decorated with celebrity obituaries, large chandeliers hanging from the ceiling, and a large U.S. flag painted on the wall and accented with lights. This place is a feast for the eyes and tastebuds! 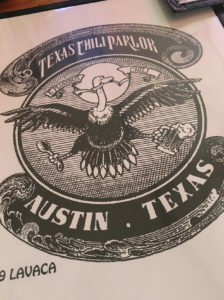 Texas Chili Parlor…After touring the state capital building, it was time for lunch and an employee at the capital suggested this place. Actually, she recommended Chipotle, to which I responded…”We have those in Ohio. I want something unique!” She quickly directed us to this small chili place just a few blocks from the capital. Now, if you think the best food comes from those dive, hole-in-the-wall kind of places…then, this is your place! 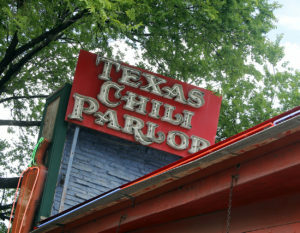 The decor is nothing to boast about, but the chili is some of the best I’ve ever tasted! I immediately felt at home when I ordered my standard beverage of iced tea with lemon, and I clarified it by saying UNsweetened (since we were in the south)…AND he said that’s all we serve here! Now for the chili…I had trouble deciding what to order so I went for the “chili taster”…a sampling of three varieties. 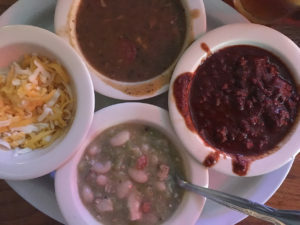 I chose the white pork chili, the black bean and sausage chili, and the gumbo. They were all sooo good that I don’t know what my favorite was! 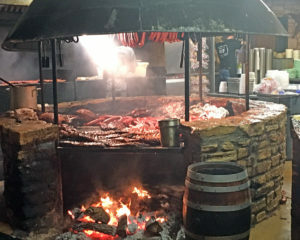 Salt Lick…This well-known BBQ place is located in Driftwood, about 30 minutes outside of Austin. My husband had eaten there on a business trip and brought back a jar of their sauce, but it was my first time there. There was a 45 minute wait, and we sat outside in the rustic patio area and listened to a guitarist while we enjoyed a beverage. Somehow, I forgot to take pictures of this area, but trust me…it had such a fun vibe! Lots of wooden picnic tables and benches, white lights strung around the trees and arbors. We decided it was a good thing that our oldest was not with us for this meal, as she is a vegetarian! Not too many meatless options on the menu! 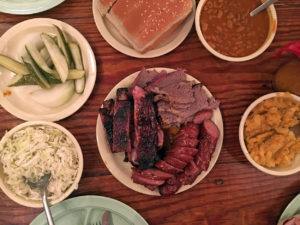 We ordered the “Family Style”…which is all-you-can-eat beef brisket, sausage, pork ribs, and potato salad, cole slaw, and beans. 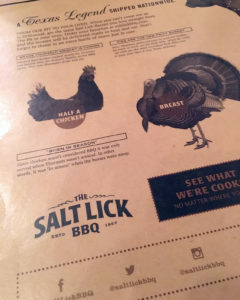 The sausage and ribs were my favorite! Such great flavor! 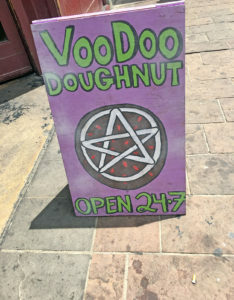 And that was our day of eating in Austin!